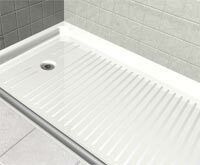 Many people buy Accessible Shower Pans as a pre-fab solution for the shower base. An accessible barrier-free pan can be combined with ceramic tile walls for a beautiful custom shower which accomodates a someone in a wheelchair. Installation of an Accessible Shower results in the shower threshold at the same level as the bathroom floor or at most a 1/2" beveled curb. A wheelchair accessible bathroom shower allows handicapped individuals and people of all abilities to enjoy a safe and comfortable bathing experience. 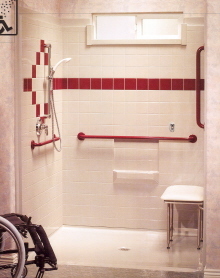 Accessible Shower Bases are available for roll in showers and transfer showers, as well as corner showers. 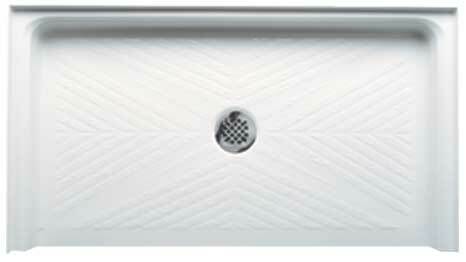 Shower pan models come with both center and end drain locations. Accessible Shower Pans have slip resistant self-supporting pre-leveled bottom allowing you to do snap in style installation without any mud setting. All of our handicapped accessible shower pans ensure ultra-low thresholds for easy access for disabled individuals and seniors as well as people of all ages and abilities. A variety of sizes, colors and threshold styles are available to accommodate your individual needs. 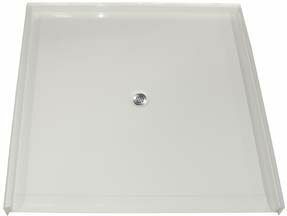 Custom shower bases (also referred to as custom shower pans) provide a snap in solution for the shower base. These barrier free shower pans are categorized into two groups. 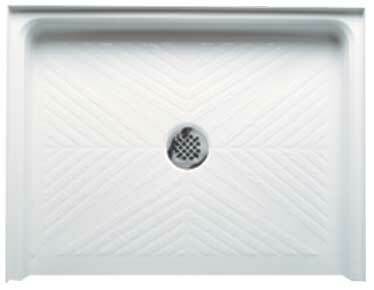 In general, Accessible Shower Pans are for residential projects and ADA Shower Bases are used for commercial projects. We also offer complete Accessible Shower stalls for stylish barrier free bathrooms for residential construction and remodeling, see Accessible Showers. 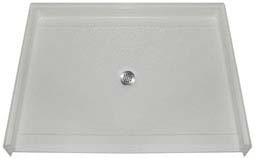 For your convenience we have organized our bathroom shower pans into Accessible and ADA categories. CLICK ON THE PDF ICON NEXT TO THE MODEL TO VIEW THE PRODUCT DATASHEET. 38 5/8" x 38 7/8"
Accessible and ADA compliant Shower Bases come with a 3 year manufacturers limited warranty, on defects on the fiberglass shell. Accessible and ADA showers are also available with complete snap in wall surround kits, which feature many colors and styles see Accessible Showers and ADA showers. Call 1-877-947-7769 to be Showering in your own barrier free free shower.